Does your neighbor have an obnoxious Wi-Fi network name? You can hide it from the Wi-Fi menu on your computers, preventing it from showing up. You could go even further and block all other Wi-Fi networks, too, only allowing your PCs to see and connect to the Wi-Fi networks you allow. This is handy if a neighbor has decided on a network name that’s inappropriate for small children, or a neighboring network is open with no parental controls. Whatever your reason, you can stop that network from showing up on any Windows PC with a few commands. This is accomplished via the netsh command, run as an Administrator. To open a Command Prompt window, open the Start menu, search for Command Prompt, right-click the “Command Prompt” shortcut, and select “Run as administrator”. You can hide an individual network by adding it to the block list. It won’t appear in the list of nearby available Wi-Fi networks and you can’t connect to it from Windows. To block a network, run the following command, replacing “WIFI NAME” with the name (SSID) of the wireless network. This is just the Wi-Fi network name that appears in the standard Wi-Fi popup menu. Repeat this process to add more networks to your Wi-Fi blacklist, if you like. This command filters based on the network name. So, if your neighbor renames their Wi-Fi network, you’ll see the new name appear in your Wi-Fi list. Rather than hiding individual networks, you could alternatively add one or more Wi-Fi networks to the allow list, and then block all other networks. This ensures a device can only connect to the networks you approve. Of course, this is inconvenient if you’re using a portable device like a laptop—if you whitelist only your home network and take the laptop elsewhere, you won’t even be able to see any other Wi-Fi hotspots without changing this setting. To add an allowed Wi-Fi network, run the following command, replacing “WIFI NAME” with the name (SSID) of the wireless network. 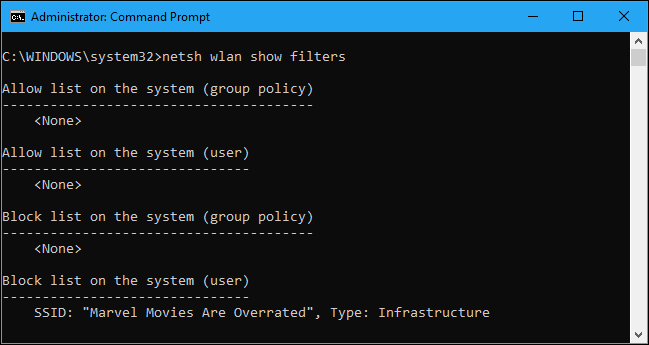 Repeat this process to add more networks to your Wi-Fi whitelist, if necessary. You can also optionally remove the allowed Wi-Fi network rules you added. Just run the following command, replacing “WIFI NAME” with the name of the Wi-Fi network. You can use the above commands to delete any filters that appear here. Just use the same command you used to create the filter, replacing the word add with delete in the command. Anyone with Administrator access to the computer will be able to visit the Command Prompt and undo this change, if they know what they’re doing. So, if you use this to lock down a child’s computer and force them to connect to a Wi-Fi hotspot with parental controls enabled, be aware that child could undo the change if they have Administrator access to the PC (and are good at googling Windows commands). Network administrators can use Group Policy to roll out Wi-Fi network filters, allowing them to manage which Wi-Fi networks are allowed or blocked on centrally managed PCs.